Medilink is committed to investing in the CPD of its staff, whether permanent or roster-assigned, and to being a standard bearer for internationally-recognised medical credentials. To be effective in developing the expertise of our specialist remote medical teams, our mission is to deliver industry-standard courses at source, on the ground, at our dedicated overseas clinics and centres. This enables us to build on our corps of professional local staff and improve our overall service capabilities directly in the regions in which our clients operate. 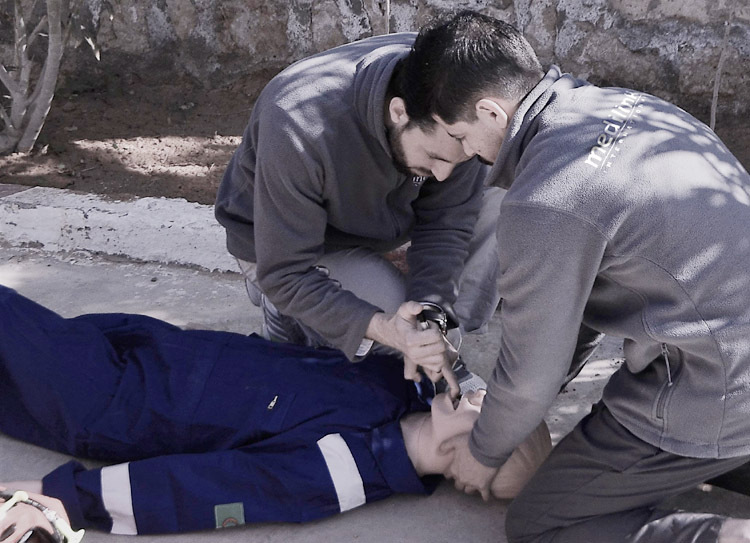 To this end, our Hassi Messaoud Medical Centre has recently obtained accredited NAEMT (National Association of Emergency Medical Technicians) status, enabling us to deliver key training courses, such as Pre-hospital Trauma Life Support (PHTLS) in Algeria. We recently ran a two-week, intensive course during which a core group of Medilink doctors and nurses were trained in PHTLS, and the American Heart Association-accredited Advanced Cardiac Life Support (ACLS) course. Medilink will be running these and related training courses regularly at Hassi Messaoud. What is a NAEMT Training Centre? NAEMT education aims to provide globally-accredited training to enhance the knowledge and skills of public and private sector emergency medical services (EMS) practitioners from paramedics, emergency medical technicians and emergency medical responders to other professionals providing pre-hospital and out-of-hospital emergency, urgent or preventive medical care. To further this mission, NAEMT partners reputable third-party training providers who have demonstrated their expertise and capacity to conduct the organisation’s rigorous training courses to the required international standards. NAEMT training centre status is granted to those who demonstrate clear commitment to developing and sustaining a quality EMS training programme long term. Training centre status demands adherence to a stringent list of criteria and requires accredited centres to undergo periodic assessment to ensure standards are maintained. NAEMT itself was founded in 1975 and now has around 65,000 members drawn from all professions and sectors of EMS, spanning government service agencies, fire departments, hospital-based ambulance services, private companies, industrial and special operations’ settings, and from within armed forces’ services. As a body, it supports EMS research and innovation and lobbies on behalf its members, as well as disseminating knowledge on a wide range of issues that impact EMS.